Magid's Weld Pro T8800 13" MIG welding gloves feature black premium pig grain leather on the palm and back of the index finger for optimal flexibility and protection. The gold split cow leather back and cuff provide rugged protection and cost-savings over all-grain gloves. The gloves also feature a foam lining on the back, a canvas-lined cuff, and a shirred elastic back for exceptional comfort and protection. To top it off, the T8800 features a leather thumb strap and sewn-in leather palm patch for increased durability and protection. 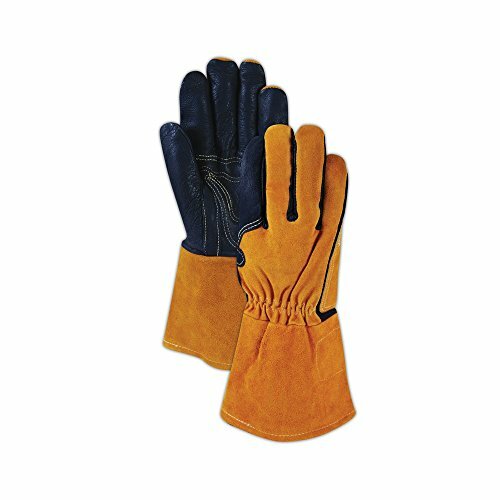 T8800 gloves are sewn with Dupont Kevlar thread, keeping your hands safe and your work uncompromised.